Classic appetizers like deviled eggs are a party favorite. They’re simple but elegant, and a wonderful grab and go bite. Some of the most memorable parties of my childhood were ones that I wasn’t exactly invited to. The neighbor’s Easter dinner. Another neighbor’s Fourth of July bash. I was friends with relatives of both neighbors and somehow would be invited to join them. What’s one more person? They were big affairs for big families — loud and busy, loving and filled with laughter. And the tables were always heaped with homemade food. At Easter, that meant ham, scalloped or au gratin potatoes, salad, green beans and, of course, deviled eggs. I developed such an affinity for those eggs — well seasoned with creamy piped in yolks. Delightful. 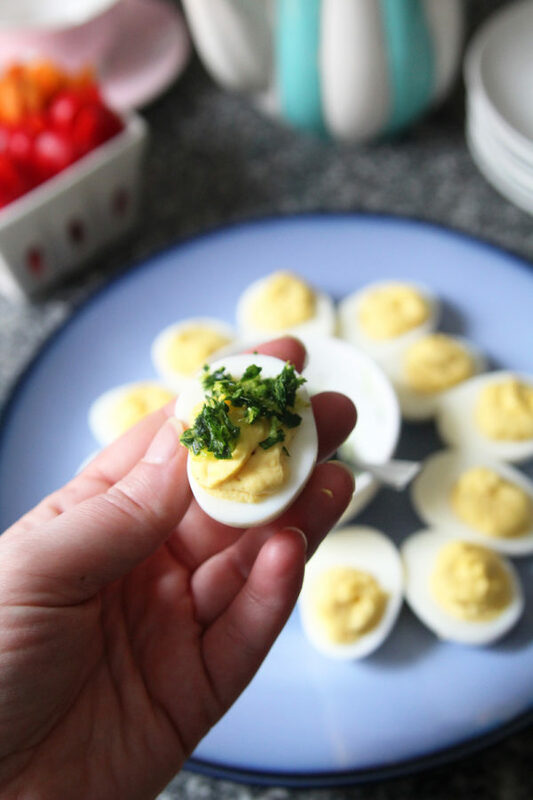 And whenever I make deviled eggs now, I think of that time — things seemed so much simpler. 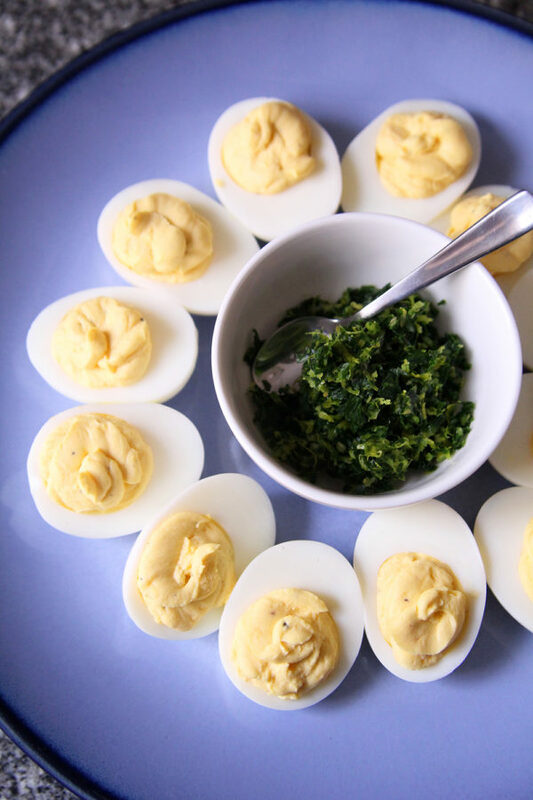 This version, Deviled Eggs with Gremolata, takes the classic and gives it a fun twist. with this classic Italian condiment made with just three ingredients: parsley, lemon zest and garlic. Serve it with the eggs so guests can sprinkle it on. The creamy yolk filling is turned up a notch with the fragrant herby, citrus-y, garlicky sprinkle. 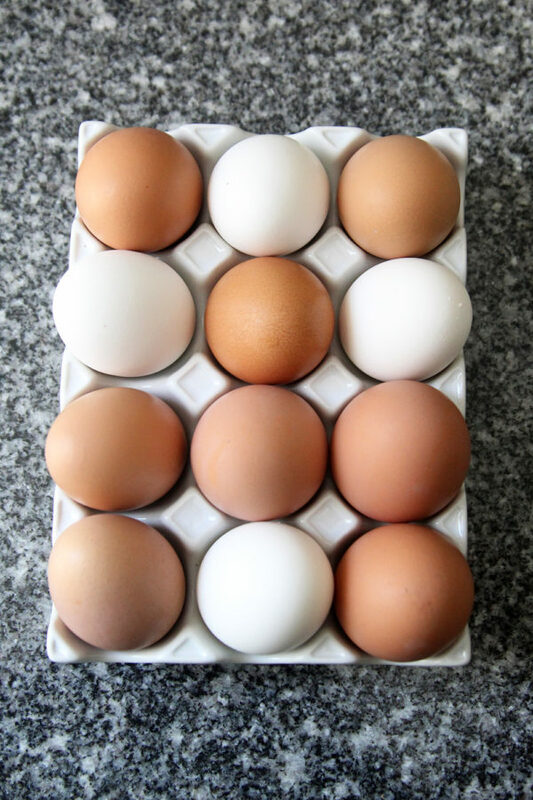 Start by making hard-boiled eggs with eggs that are at least a week old. The older the egg, the easier it will be to peel them. 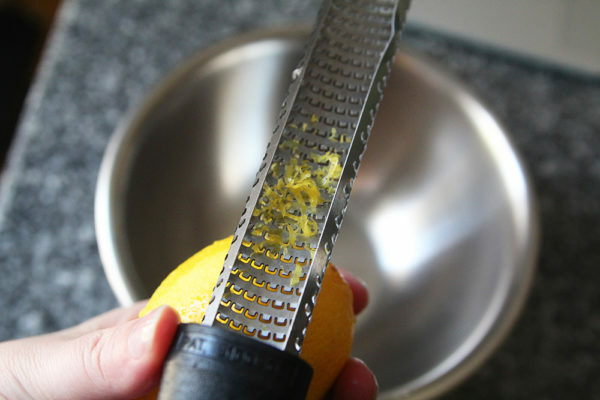 Once they are cooked and cooled, do peel them. Next, cut the eggs in half. 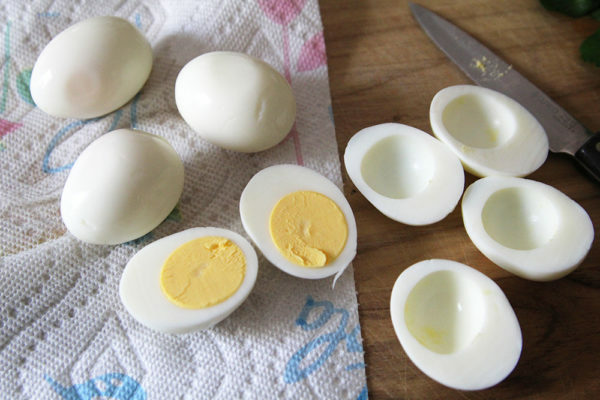 Squeeze them gently to pop up the yolk and remove that to a bowl. Mix together the filling ingredients. You’ll want to use the tines of a fork for this, pressing the yolks to mash them as you mix. Also, it’s no mistake that the egg filling only has a little salt. It doesn’t need much. But do taste the filling before using it. If you feel it needs a little additional salt, add a pinch or two. Once the filling is made, pipe it into the cavities of the egg halves. You could use a fancy piping tip for this, but I typically keep it simple. Chill the eggs until you are ready to serve them. Deviled eggs always taste better after chilling a bit. Then it’s time to make the gremolata. 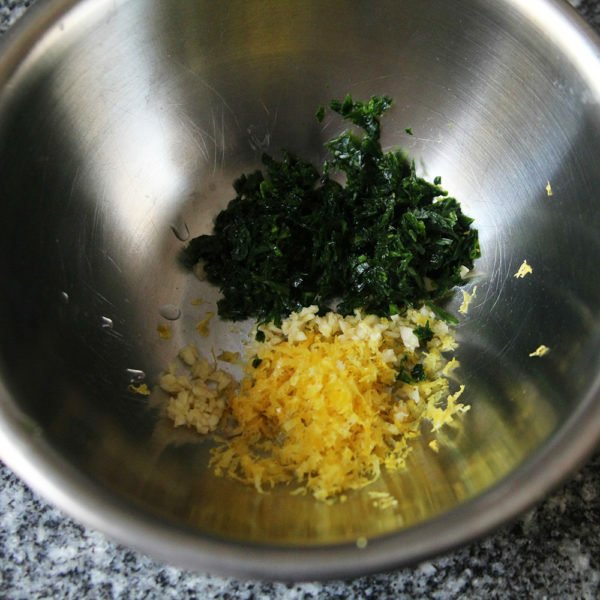 The zest of one lemon is stirred together with a little minced garlic and finely chopped parsley. That’s it. Once it’s stirred, it’s ready. Store it in an airtight container in the fridge until you are ready to serve it. As for serving, I believe in a simple approach. A nice plate or platter is perfect for this. While the fancy deviled egg platters are convenient, I don’t need a serving piece I use only for one food. Well, except a gravy boat. Classic appetizers like deviled eggs are a party favorite. They’re simple but elegant, and a wonderful grab and go bite. 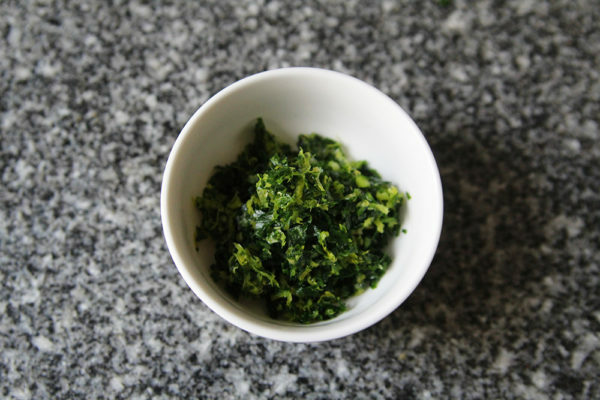 This one has the added elegance of gremolata, a simple Italian condiment of lemon zest, parsley and garlic. 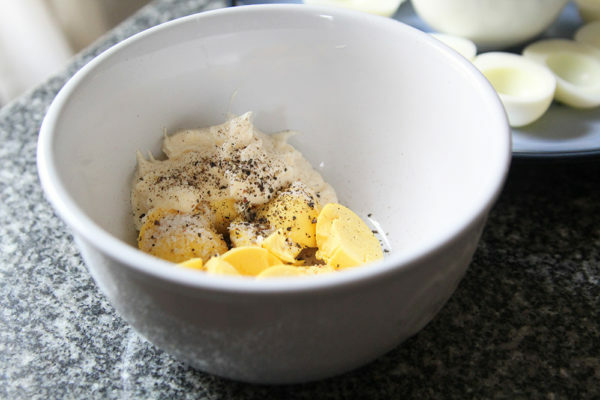 Cut the eggs in half and remove the yolks to a small mixing bowl. Arrange the intact egg white halves on a plate and set aside. To the mixing bowl, add the mayonnaise, salt, pepper and dry mustard. Mash together with a fork, stirring until fully combined and smooth. Divide the egg yolk mixture evenly between the egg white halves mounding it as necessary. 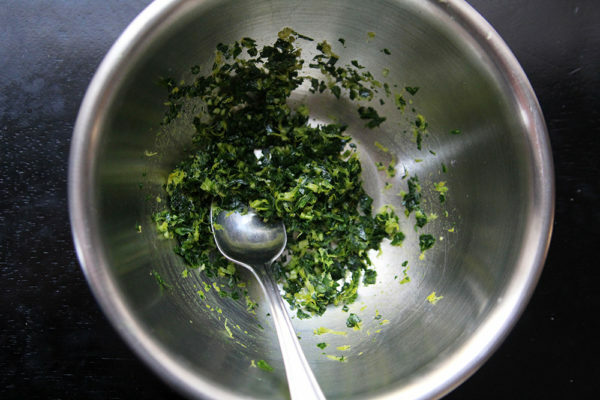 In a small bowl, stir together the parsley, zest and garlic. Sprinkle over the eggs. Or serve in a bowl alongside them. Welcome to Progressive Eats, a virtual version of a Progressive Dinner Party. If you’re unfamiliar with the concept, a progressive dinner involves going from house to house, enjoying a different course at each location. This is my first time participating in this monthly virtual dinner party and I am so excited. I hope you enjoy this as much as I do! Each recipe in our menu this month features eggs and our host this month is Carol Borchardt at From A Chef’s Kitchen. With Progressive Eats, it’s a virtual party. A theme is chosen each month, members share recipes suitable for a delicious meal or party, and you can hop from blog to blog to check them out. Come along and see all of these delicious dishes that feature eggs! My husband would like me to make deviled eggs every week! Now that I see your terrific recipe, I’ll be treating him soon!!! Thank you! Hope he loves them! My kids were so surprised by how much they liked the addition of gremolata to the eggs. Back in the day things were just fabulous!! 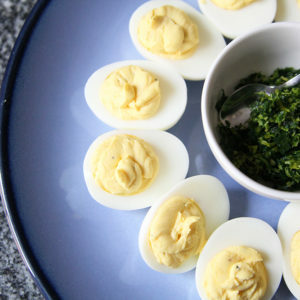 I love the spunky, colorful addition of gremolata on these deviled eggs. Looks refreshing and takes the eggs up a notch. Well now I need deviled eggs. 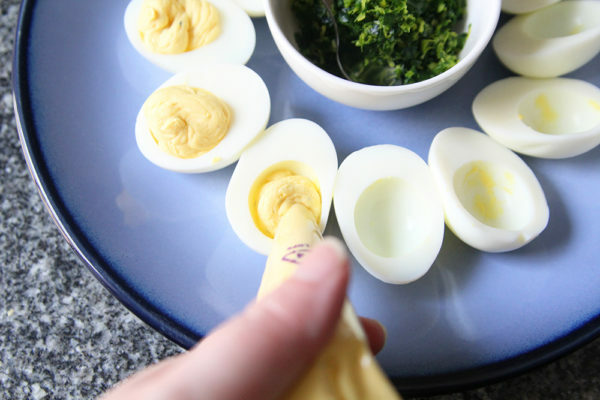 What a cool way to serve deviled eggs. Love the gremolata topping! 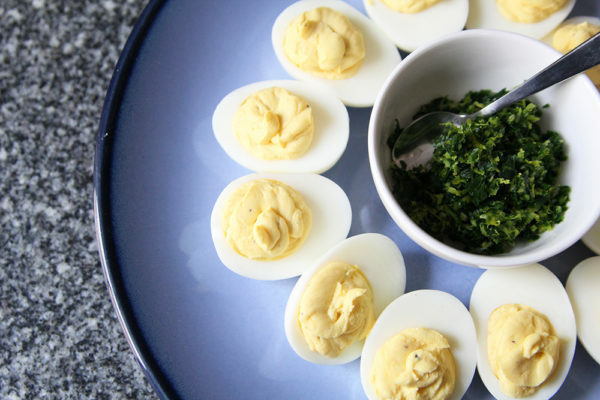 Gremolata is one of my favorites but I never thought to combine it with deviled eggs. Such a great idea! Can’t wait to make them for my family! I could eat a dozen of these deviled eggs. Although I didn’t have them growing up, as an adult they have joined the ranks of comfort foods that I would walk over hot coals to get, preferably in large quantities. And adding gremolata is a genius touch that really takes them up a notch. What a treat! 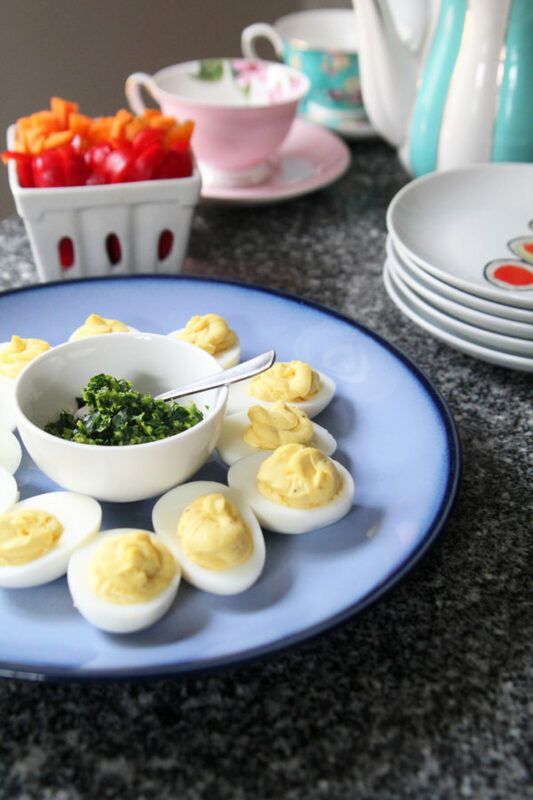 Deviled eggs are such an old fashioned addition to group gatherings but I never tired of them. I might scarf down more than my fair share too! The gremolata is a terrific idea; I will definitely try that next time. I would be remiss first if I didn’t say welcome to our group; we’re so glad you joined Progressive Eats. And even more importantly? Oh my…that pitcher and those cups? I don’t often have background pieces jump out at me but Sarah those are absolutely gorgeous! I never tire of them either. But I always forget just how easy they are to make. And thank you! I am so excited to be part of the group! I decided this is the year I’m going to venture out from the typical deviled egg and try some new variations. I am in love with that gremolata and definitely going to try them this way! Such a fresh and beautiful way to top off deviled eggs! Well I love crashing parties and I love devilled eggs. I really never make them but my daughter loves them. She’ll be back home finally in May – think I’ll surprise her one day with some of these beauties. Thanks for all the tips and tricks for success. And I love this comment so much. I was such a party crasher as a kid. LOL. Wish I still had that level of fearlessness! 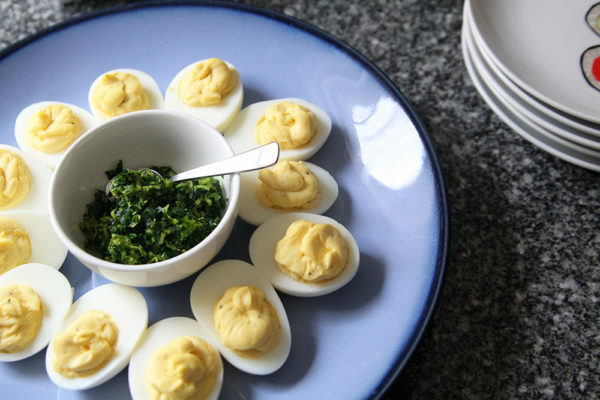 Clever idea to serve deviled eggs with gremolata on the side. Perfect for those who want a nice flavor boost. My mom made deviled eggs all the time, and I LOVED them. This is such a wonderful easy, but fancy, way to make them with gremolata. The flavors are PERFECT for eggs!! !